A Class Drivers – specialise in Airport transfers and cruise transfers, long distance taxi transfers, inter-city business trips, property relocation tours as well as important document/package delivery anywhere in England, Scotland or Wales; we are long distance taxi journey specialists. As Fully Licensed Private Hire Operators based in Cardiff, South Wales, we offer very competitive prices for airport transfers to and from all UK airports and an executive long distance taxi service to all UK City centres, bespoke sight seeing days, business trips and all other travel links & journeys, whatever your needs. Airport Transfers: book your airport transfers with us and you can be assured that you will travel in a comfortable, quality vehicle of executive class standard at less than the average taxi prices, you will receive a courtesy and service you would normally associate with a more expensive “chauffeur” service, as our standard. Our professional, articulate drivers not only have extensive local geographical knowledge of Cardiff and South Wales, they are all extremely experienced and familiar with regularly driving across all parts of the UK on long distance transfers with individuals, families and corporate clients. Our drivers are most accustomed to airport transfers covering all the major airports such as Bristol Airport, Birmingham Airport, London Heathrow Airport, Gatwick Airport, Stansted, Manchester and many more. Always meeting and greeting our clients means that our drivers are very familiar with every airports’ arrivals area, protocols and the way airports operate. Subject to availability, we have a select few, fully licensed professional lady drivers, also CRB DBS checked chaperones and escorts available upon request. Be assured that when you book your airport taxi transfer with us, we will track your flights to ensure timely pick up and drop off, we offer a free “meet and greet” service included as standard, you will be driven by one of our experienced professional drivers in comfort, making your long distance taxi journey a stress free, enjoyable way to travel from your door directly to the airport and home on your return. For long distance taxi journeys like these we offer a free complimentary travel pack which includes water, tissues, sweets and if requested, a daily newspaper. Our customer is our priority at A Class Drivers. We offer a friendly, safe & professional, airport transfer and long distance taxi service tailored to your needs, which is why we don’t have an automated booking system, as all of our clients are individual in their requirements and quotes will reflect this, whether a one way long distance taxi journey, airport transfer or a bespoke wait and return – we aim to give you the best possible experience at the most competitive price. We pride ourselves on being punctual, helpful, polite & well presented at all times. We only take advanced bookings for Airport Transfers and long distance taxi journeys, as every customer is our priority. Why People Choose A Class Drivers…..
All Vehicles Fully Licensed and Insured. With A Class Drivers, licensed private hire operators based in Cardiff, you can also be assured that our articulate, experienced drivers are CRB DBS checked, fully insured and licensed with Cardiff County Council as are all vehicles. Be safe and legal on every long distance taxi journey! Because we are a family business we are able to offer our clients a more friendly and personal door to door service than larger companies, our overheads are lower so we can pass these benefits & savings on to you, our customer. “You’ll thank your lucky stars that you found A Class Drivers -we have. We were looking for a reliable company to take our 93 year old mum from Cardiff to Harley Street for eye treatment. By chance, my sister found a link to A Class Drivers and contacted Sarah to find out more about the service that they offered and to explain our requirements. Nearly a year on from that first conversation, we have enjoyed six return journeys to London with A Class Drivers. We have had a courteous, competatively priced and customised service every time. The vehicles are top of the range, immaculate and comfortable. Its great to have such a quality service available in Cardiff. Think this conveys what we all feel! BethCardiff to Harley Street London wait and return. Very happy with the service. Sarah was extremely helpful when booking on the behalf of a client. Wouldn’t hesitate to recommend or use A Class Drivers in Cardiff again. Very prompt and professional executive taxi service. Will be using again. Journey from Caerphilly, near Cardiff, to Heathrow Airport was extremely comfortable in a quality vehicle. Very pleased with the city sight seeing trip to London we had with A Class Drivers. Helped with shopping, very friendly driver. Will be booking our airport transfer with them soon. Would highly recommend. Many thanks. Booked an airport transfer with A Class Drivers in May to Heathrow after ringing round for quotes and they came back with the best quote. They where extremely helpful when booking, the car was a really nice car, very clean and comfortable – I even had water & mints! Can’t say enough about the driver, he was brilliant – really helpful and friendly. I genuinely felt that I wasn’t just another passenger, a bit like having a chauffeur car rather than a taxi which was nice on such a long distance. Wouldn’t hesitate to recommend or use this company again. The service and professionalism shown by your driver was impeccable. You responded to my query within the hour and kept in touch in order that I met you at the agreed time. You made my journey hassle free and got me to my appointment on time. Much appreciated and I would recommend and definitely use you again. Thank you! On behalf of us all, please thank Ian for both great trips. We have been so luckly to find your company. Very pleasant journey with a most capable driver. He arrived on time, ID on display. Helped me with loading my luggage into car and I felt at home all the way to London. They really helped me out of a scrape and the service was 110% for the price. If you needa long diatnce taxi, A Class Drivers is the way to go! If and when we are back in the UK we would definitely be using your services again and will recommend you to anyone going as well! I would like to thank you for your services and would like to praise Ian as our driver. He was very polite, considerate and drove at the perfect speed. The car was clean, spacious and comfortable. I would highly recommend him and this company to my friends. Thank you so much. I really appreciate all of your help and understanding. I will definitely keep you in mind for the future, and recommend you to everyone. You have made my life much easier at a difficult time. Just wanted to say thank you for an excellent service in bringing us home. Ian was fab and extremely helpful. Hope your business will continue to flourish. We need companies like yours! Will spread the word and stay in touch. Both Simon and I thought Martin was a fantastic driver – we both thought he was one of the best drivers we have ever had and we would recommend him very, very highly indeed, 10/10. Thank you so much for all your help on such a busy weekend with the strike and the cricket. Much appreciate this and we would both recommend your firm in the very highest terms. Licensed private hire operators with Cardiff City Council as are all vehicles and all drivers. 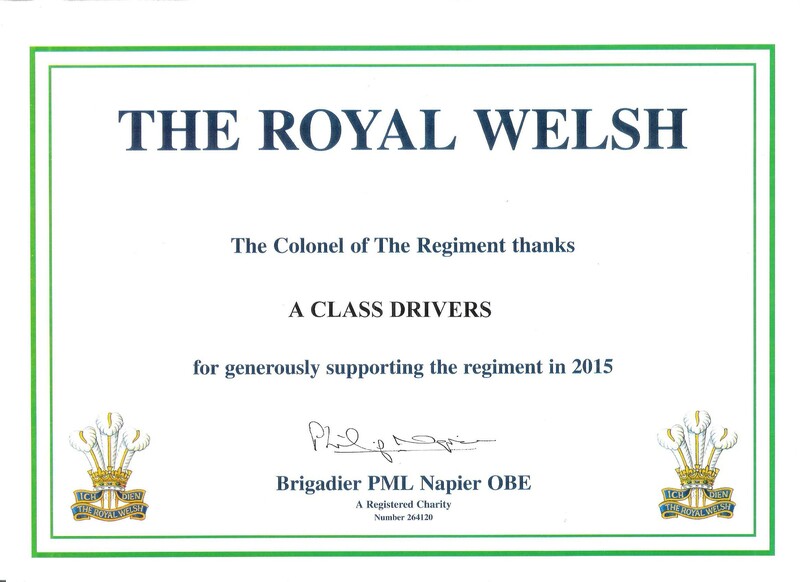 A Class Drivers is proud to support members of our armed forces here in Wales, and across the UK offering discounted rates for Airport transfers and long distance taxi services. A Class Drivers also offer discounted rates for NHS staff for all our airport transfers and long distance taxi services.